I’ve never recovered from that. Those words haunt me. They murder an innocent child instead of the people who kidnapped and raped her? Who is this man? I know by his words that he’s haunted too, he knows on some level he did the wrong thing. How can things like this continue? Our last performance of the season is today. I’m a little sad. 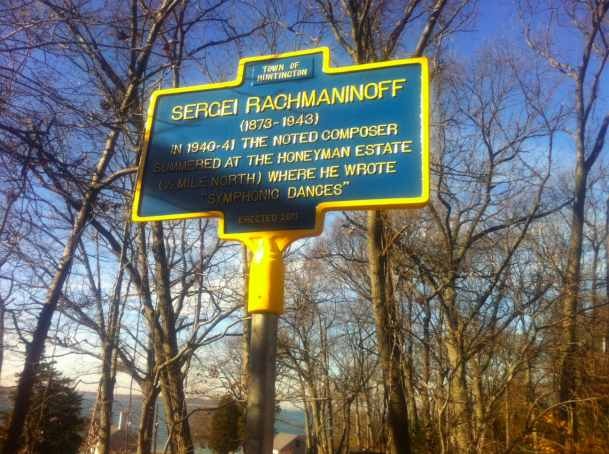 My niece, Ellie Horn, initiated a benefit to put up a sign commemorating the fact that Rachmaninoff had lived and worked on Long Island. Thank you for the beautiful shot, Kevin Krooss! There are no adequate words for such evil. And yes, music is wonderful…the UNIVERSAL language of what is beautiful and precious in our world. The power to sooth, to heal, to speak of the love and grandeur humans can aspire to. Your niece sounds like an amazing person. Tragically, honor killing is a widespread practice in Islam. It is regarded as a traditional and venerable practice in complete conformity with Islamic moral and religious teaching. It is hard to imagine having 5,000 or 6,000 members of Islam without at least a handful who would regard this as a valid religious solution. It is not something that could be completely eradicated for many generations, if ever. Well, I don’t think widespread is accurate. It’s also not a religious practice, although radical Moslems, like the Taliban, might try to say it is, but there is nothing in the Koran about honor killing. However, I agree fundamentalists are slow to change, if ever. Weirdly, for my book I needed to research slavery, then the resistance to eradicating slavery, then segregation and the resistance to ending segregation, and yet even today we still have people like Pat Buchanan publishing books talking about how great America was when we were segregated. But we need to keep hoping, and trying, and educating people. I have to believe people can continue to become better and evil practices can be abolished. Honor killing is just one of the dark sides of multiculturalism. When multiculturalism started I thought it just meant more pavilions at folkfest and was naive enough not to realize that the dark side always comes right along with the light side. My understanding is that honor killings happen a lot in some Islamic countries and less in others. Regrettably, it is not uncommon. I agree that in time perhaps the horrible practice will diminish. However, Muslims will have to be the ones that hate it enough to put a stop to it. We Anglo-Saxons have virtually nothing to say about it that is effective. Hey, I don’t need to be persuaded that this is an evil thing. I’m just objecting to calling it a Moslem thing, and also to characterizing it as common (and now also calling this the result of multiculturalism). Which is not to say it doesn’t happen a lot or too much. Anything over 0 is too much and the real numbers are horrifying. I would argue that most, if not all moderate Moslems abhor the practice, and the number of moderates are growing. The best response to this is education, prosecutions (which have slowly started) and what has already begun and what moderates have already begun doing themselves, rebelling.